Hale, Kathleen, Illus. Puss in Boots. Boston: Houghton Mifflin, 1951. Houghton Mifflin published this book as part of its "peep-show" series. It provides 360-degree carousel world composed of layered scenes in which Puss can cleverly maneuver and engineer a happy ending. The stage format of the tableau invites children to script, direct, and add to the fairytale. 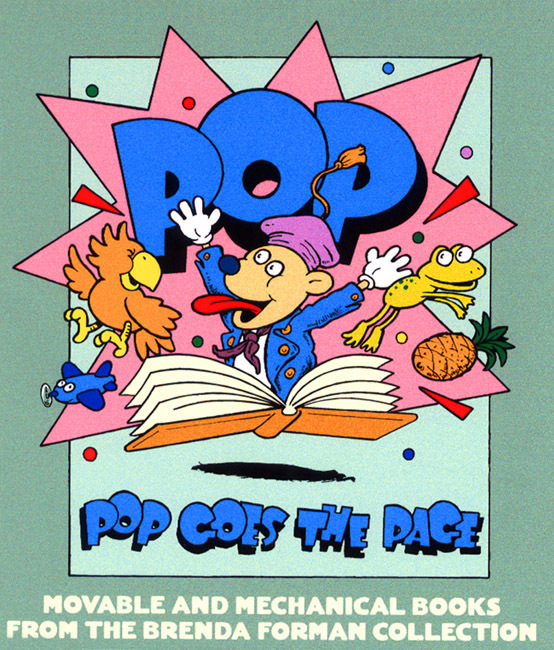 Pop-ups, the generic name for mechanical, movable books, unfold and rise from the page to our surprise and delight. Through the use of rivets, flaps, tabs, folds, and cut paper, these books perform before our eyes. Each page becomes a stage, inviting action and participation. Here, physical transformations make dynamic the static illustrations. In the moment of touch, we, the operators, escape the mind and pop into the page. The mechanical book grew out of early scientific and mathematical works. As early as the Middle Ages, turning disks, or "volvelles," appeared in books for astronomical, geographic, and numerical calculations. This section displays a 1524 edition of Apianus' Cosmographia, whose volvelles draw directly on the discovery of the New World. However, the pop-up book did not come into its own until the late nineteenth century. The art form flourished with the birth of industrial printing, chromolithography, and new publishing markets aimed at upper-class children. With the recognition that children's books could entertain as well as instruct, the stage was set for the reader to become an "operator"-- playwright, director, storyteller, actor, and spectator all combined in one. The pop-up book experienced a mixed fortune in the twentieth century. The world wars precluded the high-quality German printing of the nineteenth century and interrupted production. With the Great Depression and post-war changes in consumer culture, publishers were forced to alter the production process, lowering standards to reach a mass audience. Not until the 1960s did the pop-up book return to its celebrated status. The 1980s and 1990s witnessed a pop-up renaissance in which paper engineers defied gravity to create space and volume with the turn of a page. This exhibition traces the history of the pop-up and features the work of pop-up masters. In the various sections, Dean, Meggendorfer, Nister, Kubasta, Pienkowski and other creative geniuses reveal the imaginative worlds waiting to spring from a piece of paper. The devices, ranging from simple sliding tabs, slats, and folded paper to tableaux, rivets, and true pop-ups, occupy a spotlight of their own. Although technologically advanced at the time of their publication, pop-up books rarely challenge social and cultural mores. As children's books, they set standards for behavior and generally subscribed to the status quo. These works, therefore, also give a glimpse into the nurseries and lifestyles of their readers. Pop-up subjects include fairy tales, Mother Goose, farmyards, and even alien encounters. In today's world in which entertainment arrives at the push of a button, the pop-up offers us an early example of interactive media, while also providing an alternative to the flat screen. Created through a combination of mechanical and handcrafted techniques, pop-ups ultimately depend on a little glue and paper and a lot of imagination. Movable and mechanical books engage us on a fundamental level by surprising and entertaining us. They remind us that a unique imaginative work provides the most enduring pleasure.